Swipe, select and shop! 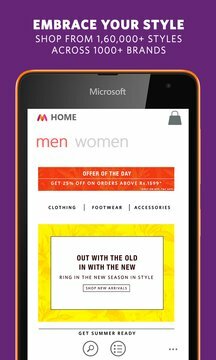 It’s fashion on the go with the all-new Myntra mobile app. Take the world of online shopping with you everywhere you go, and get all your favourite fashion merchandise (clothes, footwear, accessories, beauty products, you name it) by top brands. 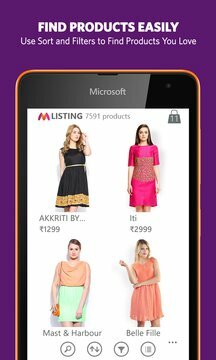 Browse through 1,60,000+ product styles from 1000+ brands instantly on the Myntra shopping app. Discover the latest trends in lifestyle and shop for clothes, kurtis, sarees, shoes, T-shirts, jackets, jeans, bags, skirts, dresses, jewellery, watches, wallets, footwear and much more. With the app, you have access to free styling tips from our fashion experts, and hot offers and deals on all your favourite products. Get the best online shopping experience with Myntra’s cool new app that offers you FREE Shipping, 30-day hassle-free returns guarantee, and a convenient cash-on-delivery option. And these are just some of the reasons that make Myntra India's favourite fashion shopping destination. * Find products you love: Choose from a vast collection of clothes, dresses, shoes, and fashion accessories for men, women, teens and kids. * Refine your search based on popularity, discount, prices, colours, sizes and more using sort and filter features. * Avail massive discounts: Easily add your Myntra coupon code directly in the app. Also, get notifications on best deals and offers. * Sharing made easy: Get style suggestions from your friends by sharing Facebook, Twitter and email. * Shop for premium and designer brands, including the likes of Guess, Steve Madden, Timberland, Boss, Desigual, Diesel, DKNY and a lot more. * Fast and Secure Checkout: Pay by cash-on-delivery, net-banking, or credit and debit cards options. * Wishlist: Save stuff for later by adding to your wishlist straight from the app. * View detailed product information with rich images and style notes from our fashion editors. * Log in seamlessly using Facebook. So, what are you waiting for? Download the best online shopping app and get shopping now!